The frenzy in healthcare as in every other industry is around the power of Big Data. Yet in healthcare most if not all of the data we have been trying to dissect has been tethered to the healthcare delivery system. As the race ensues to create the truly engaged consumer, the solution ultimately lies in the ability to understand trends, preferences, profiles of people in their daily lives and the lifestyle they lead around health. Google , Facebook, Apple have defined the dictionaries of our interests, likes and dislikes but why not health? Have they missed the opportunity? 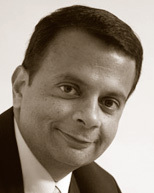 In this webcast talk Dr. Sreedhar Potarazu (Dr P), Fox News Contributor, Acclaimed Author and Nationally Recognized Expert on Big Data and Healthcare, tells the story never told on the next "Big THING" in healthcare and the lessons learned from Silicon Valley and why it has not conquered healthcare. Don't miss this informative presentation. Dr. Sreedhar Potarazu is an acclaimed ophthalmologist and entrepreneur who has been recognized as an international visionary in the business of medicine. He is the founder and CEO of VitalSpring Technologies Inc., a privately held enterprise software company focused on providing employers with applications to empower them to become more sophisticated purchasers of health care. Dr Potarazu has personally served as a consultant to Fortune 500 companies such as Microsoft, Kodak, McDonalds, Google and Amtrak in managing the cost and quality of healthcare for their workforce. Dr. Potarazu received his medical degree from The George Washington University and subsequently completed his internship in surgery and residency there as well. He completed fellowships in Neuro-Ophthalmology and glaucoma at the esteemed Bascom Palmer Eye Institute at the University of Miami in Florida. Dr. Potarazu practiced seven years in the Washington, D.C. area, during which time he was on the faculty of the Wilmer Eye Institute at Johns Hopkins University. While practicing, he earned an MBA at Johns Hopkins with a focus on health information technology. It was his thesis that ultimately served as the basis for the original business plan of VitalSpring. Dr. Potarazu is widely recognized as an industry leader in health care and health-care technology and is a sought-after speaker on the topic. He currently resides in Maryland with his wife and two daughters. Dr. Potarazu is also involved in the promotion of fine arts and education to the underprivileged. He is the author of a well-publicized book "Get Off The Dime" The Secret of Changing Who Pays For Your Health Care. Dr. Potarazu, has raised over 30 million dollars for VitalSpring, without the help of any institutional or venture capital investors. Dr. Potarazu is a regular contributor to the Fox News Channel and The Washington Post.